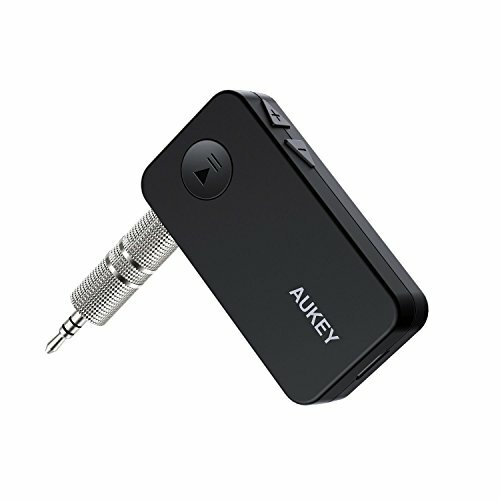 AUKEY Bluetooth Receiver, Portable Wireless Audio Receiver Car Kit with Hands-Free Calling for Home Stereos & Car Audio Systems by AUKEY at movies-out.com. MPN: BR-C2-US. Hurry! Limited time offer. Offer valid only while supplies last. Go Wireless Upgrade your stereo, wired speakers, or wired headphones with Bluetooth technology, and free yourself from the tangle of audio cables. Upgrade your stereo, wired speakers, or wired headphones with Bluetooth technology, and free yourself from the tangle of audio cables. Put the Bluetooth function of your phone to good use- stream your music wirelessly to an existing stereo system at home or in your car. Bluetooth 4.1 provides fast, easy, energy-efficient connection for wireless audio streaming with a range up to 10 meters / 33 feet. Plug the BR-C2 into your stereo using the 3.5mm audio connector or cable (both included) or plug your wired headphones into BR-C2 directly. Then just pair with a Bluetooth-enabled device and enjoy your music. Dimensions: 1.47" x 0.75" x 0.33"